When Tufts recently sharpened its focus on increasing its number of endowed professors, it made what Sol Gittleman called a smart move. Whether endowed professors are rising stars, or already at the top of their fields, they invigorate the academic and research community with fresh ideas, high energy, and world-class expertise. “At the heart of our success as a university,” said Gittleman, H10, A85P, former provost, Alice and Nathan Gantcher University Professor Emeritus, and cochair for Brighter World: The Campaign for Tufts, “is our ability to recruit, reward, and retain the brightest minds in their fields.” And because the gifts are endowed, they strengthen the university in perpetuity. Tufts is making strides to ensure that success with the Professorship Partnership Challenge, a Brighter World initiative. The minimum to endow a full professorship is $2 million, and to endow a junior professorship, Tufts requires a minimum of $1.25 million. Through this new challenge, Partnership donors contribute sixty percent of the total cost of endowing either a full or junior professorship—and Tufts provides the remaining forty percent. At Cummings School, friends Anne and Travis Engen have already teamed up with Tufts to answer the challenge, creating the Anne Engen and Dusty Professorship in Comparative Oncology, inspired by their late corgi, Dusty. Anne Engen and Dusty shared a deep and joyful connection. “I thought he was going to be a competition obedience dog, but he declined absolutely to participate in the required ‘out of sight’ stay,” she recalled. That led her to try a canine freestyle workshop, and Dusty loved everything about the athletic competitions set to music. They would go on to travel to competitions all over the Northeast, putting on performances so exceptional that they scored appearances on the Today show and other programs. 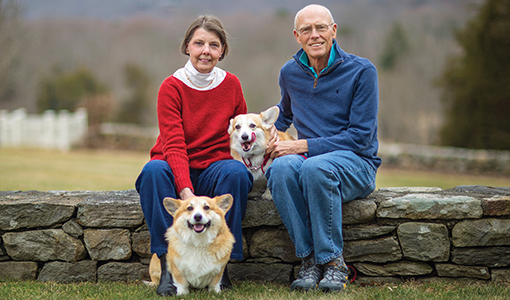 In 2009, in gratitude for the exceptional care provided to Dusty and another corgi, Belle, the Engens made a gift formally establishing a program in comparative oncology. It’s a field that brings together researchers from Cummings School and the Tufts University School of Medicine to advance understanding of cancer biology, as well as improve treatments of the disease in both animals and humans.